We again had very good participation with entries from three continents. From the comments, as well as my own observations, of Marvin's signal strength, conditions were some of the best I have seen recently. However, Mr. Doppler did not take a vacation. As always, thanks to all that participated. N8OB OH I had a difficult time on 40M but sigs were good. 80 seemed much better. Fun as usual. W4JLE SC First shot at trying this FMT. Enjoyed it thanks! W6OQI LAX K5CM signals were good on all bands here in Southern California. However, the usual Doppler made it necessary to use the dart board to decide which numbers to go with. 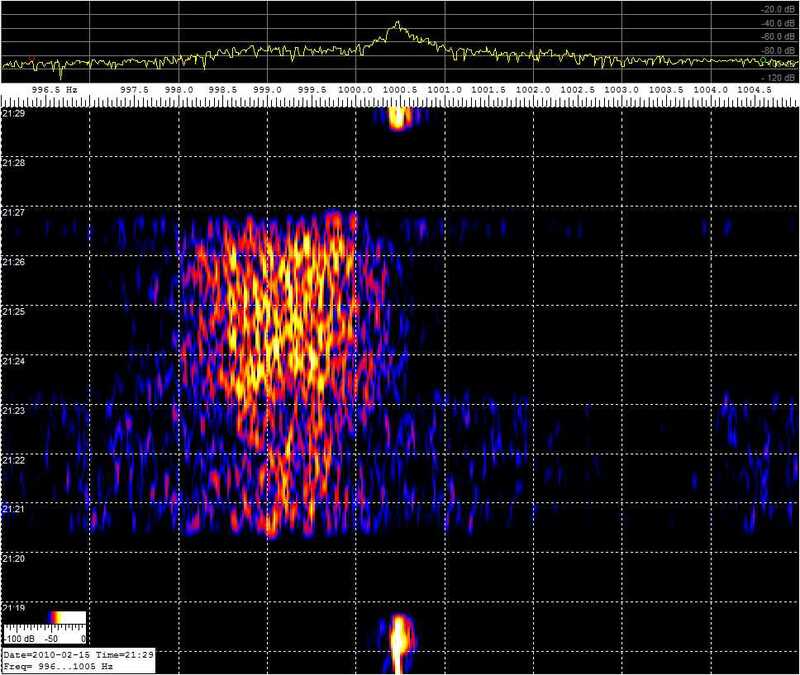 W0PHD MN noted mark difference in doppler on your different beam headings on 20 mtr sigs NE most stable for me. G3SVW DX Connie, your 13:15 - 13:21 UTC run (16th February, 2010) on 20m was S7 in Manchester. A good signal but very slow rolling QSB. Not deep, but puzzling when trying to guage the exact spot of a zero-beat against my HP 3336A. Thanks for the run. I'm off to work now, a late start for me HI! N5LBZ MS The first run Monday evening 20&40 were very weak 80M had a good signal. On the second run Tue Morning 80M good signal 40M was ok but 20M very weak with a strong carrier close by not sure I measured the right one. KØMZ KS Thanks Connie and Marvin for another FMT. I missed the first 3 tests due to a Civic meeting that evening. Marvin's 40 M signal was S-7 with QRN. Didn't have the HP10544A quite warmed up for this run. 80M signal was 20 over with QSB. K5CM morning 80 M was 40 over. 40M sig was S-7 with doppler. First 20M signal was less than S-1 and second 20M signal was at noise. I averaged both measurements for my final. As usual, all measurements were strictly by ear with 30+ year old equipment. KB3MUN WPA I was not able to make appointment for first 20m runs; there was too much local QRM for morning 80m run.2m 1.4 wavelength magount in basement .. TS140S .. FLdigi v3.13AE I curious to see is I'm getting better at this. K6BZZ AZ Thanks Connie and Marvin. Always fun and challenging. Good signals. I missed Tuesday morning 80 meter run due to operator error, hi. Using Thunderbolt GPSDO, HP-3336B, FT-817, Spectrum Lab, laptop, and excel. Attic antennas. WA1ABI RI Good signals on all runs. Tnx Connie and Marvin. W9ZB IN 80M sigs were best, others weaker with unstable phase. Got readings for all, but my new correction technique may have been a big mistake. Equipment is a home brew copy of SDR1000 with 100MHz ovenized reference, but sound card clock error is not correctable, so various calculations for final results introduce more error than I want. K6HGF LAX Severe doppler on Connie's 80 meter signal, but all signals strong. WA4FJC VA Trimble GPS DO & HP 3586B. Good signals except for the West Coast 80 M run that had extreme doppler and fading. I will now have to investigate (again) the use of a sound card program. Thanks Connie and Marcin. N3FG EPA Thanks again. It was fun. I used the wrong mode on 80M, but I tried to correct it. We'll see what happens. Hi. Good signals here on all bands. W1PW AZ Sigs were good except 40M Run 2 and 20M Run 2, which was weak, but MUCH weaker when beaming West, so I may have been hearing Long Path(?!) WC 40 was inaudible, but SL 'saw' something, so I put in the numbers that SL provided. WC80 was strong, but lots of Doppler here in AZ. Thanks again, Connie and Marvin, for these opportunities, and for the fun! K6APW/7 OR Broken one-Hertz switch on generator during calibration check after the 20 meter run -- I hope anything is close! All signals were strong for a change. N5JOA NFL Used RF Space SDR-IQ and IBM T-20 Thinkpad running SpetraVue ver 3.04. Let radio and computer warm up for 2 hours and then calibrated to WWV on 10 MHz. Antenna was G5RV dipole at 30 feet. Good signals received here in Tallahassee, FL. -70.9 dB on 80M and -77.7 on 40M. 73! VE3OAT ON Haven't done this for a while and had almost forgotten how much fun it is! Glad to be back and hope I got it right. My equipment is a little different but the technique is the same, except for the rust HI. 7L4IOU DX The first 20M (8AM loca time) was loud and clear. both 80M (21:45) and 40M (22:00) CW was clear and easy to copy. The last 20M (22:15) was delicate. I report frequency of faintly trace but not sure. In addition, K6UO WSPR 20M BEACON, was copied until this morning from last night.Propagation between North America and JA is looking seems good and stable in all bands. Thank you very much! W7KXB AZ My first Fq measuring gig. Not sure if I'm doing it right but it was fun trying. KA1BQP RI Very strong signals on both WC and EC runs. Tnx connie and Marvin. K1GGI EMA Good copy on all freqs, all aimings. Had a pretty sharp spectral line that wandered a few tenths during the first 20m run. Thanks guys. W3JW VA Best signal strengths on all runs I have heard in recent memory. Plenty of doppler and multipath to make things intersting. I also noticed the relationship between your beam heading (20 M) and received frequency. Most noticeable on the Monday nite run (peak-to-peak variation of 0.4 Hz just due to beam heading) but also seen on the Tuesday AM run (0.3 Hz peak-to-peak). Tnx fer the FB FMT. W9TJ IL PM 20 signals very poor, freq picked off of CW. 40 sigs poor QRN peak S6. 80 sigs 9+20. WC 40 QRN S9 peak 9+20 sigs S5P7 with fadug. WC 80 sigs good peak S9+20 with some QRM. Monday 80 sigs S9+40 wow! 40 QRN S4P9 sigs S4P7. 20 sigs S3P5 Dr. Doppler must have been mad at me. First trial with Analyzer. Thank you for opportunity to participate. K9KK OK HP3801a disciplining HP3336B with Spectrum Lab. Signals from BOTH K5CM and W6OQI good on all runs into central Oklahoma. Doppler shift demons were present AS USUAL. 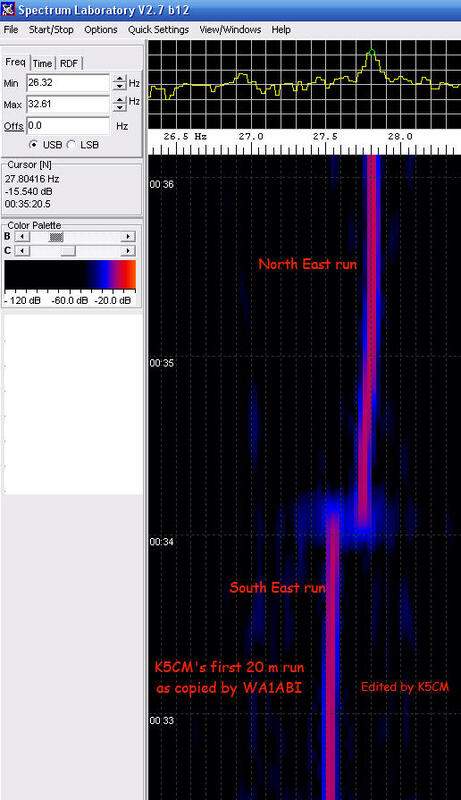 Notice the frequency difference in the South East run and the North East run. At least in this example the direct beam heading (NE) was best for John. Notice the QSB riding on the audio waveform. G3SVW, also commented on this QSB. You might find the attached screen shot interesting. With my receiver dial settings and the information from the screen shot, I come up with the FMT frequency. The screen shot is of W6OQI's 80 meter run at 9:20 pm MST. I start with the receiver tuned to 2.499 MHz WWV from which I obtain the receivers 0.189 PPM error by adding the receiver frequency to the sound card frequency and dividing by the WWV frequency. I do this over the previous several hours to make sure the receiver has stopped drifting and this is just a quick check. Then I tune the receiver to 3.566 (1 KHz low) and wait for the FMT to start. Once I hear the FMT signal, I retune the receiver until the signal is in the Spec. Lab 996 to 1005 Hz window and record the receiver dial frequency, in this case 3,566,434 Hz. This takes about 15 seconds as indicated by the signal not showing on the screen shot until about 21:20:15. Note that for three minutes, the CW signal has wider sidebands until just after 21:23 when the transmitter carrier is keyed on. Now for the next three minutes comes the hard part of selecting the real frequency from the almost 2 Hz wide scattered FMT signal. For reasons I no longer remember, I chose 999.224 Hz from amongst all the scatter as the FMT signal. Now I do the math. Add 3,566,434 to 999.224 to get 3,567,433.224 as my uncorrected measured frequency. Then correct it by subtracting 0.189 PPM or 0.674 Hz to get 3,567,432.550 Hz. I don't expect to get very close on this FMT, but hopefully will be within .5 Hz. It is always interesting to see how good or bad my guess was. Earl's guess was very close this time.... only 5 millihertz off!!! Good going Earl. A HP Z3801 GPS frequency source clocks a HP-3336B. A 10 db transistor amp follows and drives a 12BY7 / pair 6146. Then to the final amplifier, a Dentron 2500 running 300 watts out on 80, 40, and 20 meter. There are no mixers or any device in the chain of amplifiers that might impact the accuracy of the GPS frequency source. As a reality check, I periodically log the frequency source against WWV and other GPS referenced sources. I monitor each transmission with a completely separate receive system to look for any instability or short term drift. The separate system is not locked to the GPS transmitting system, but to another GPS source.